112 p., 15,5 x 23,0 cm. 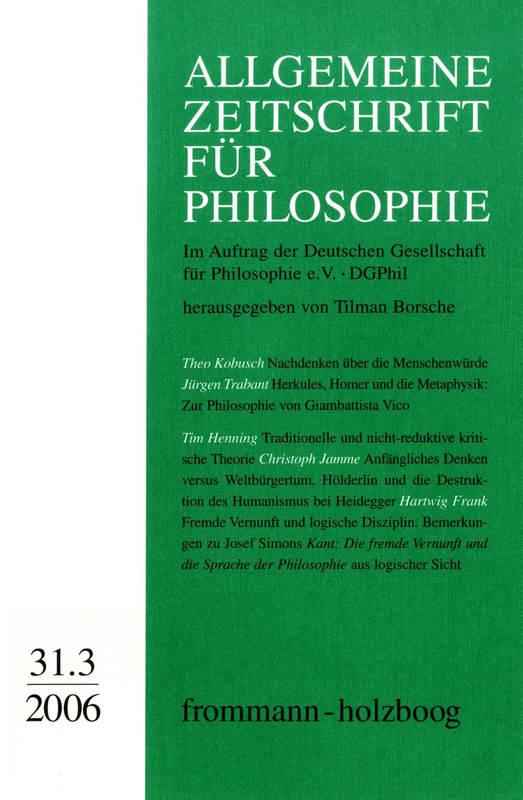 With contributions by Hartwig Frank, Volker Gerhardt, Tim Henning, Theo Kobusch and Jürgen Trabant. In the light of several current attempts to relativise human dignity (by viewing it from a merely anthropological angle as one value among others), it is important to keep in mind that this notion is rooted in a more comprehensive metaphysical tradition: taking its origin in the Christian idea that man is created as God’s image this tradition stresses that human dignity cannot be lost and that its absolute worth is grounded in the innate freedom of human beings. This conception is elaborated in the early modern natural law tradition, which also furnishes the background for Kant’s concept of the dignity of the human being as a person. The respect for personhood does not constitute its absolute worth but is the human form of acknowledging it. Although explicitly stated in the Groundwork of the Metaphysics of Morals, this idea is an often overlooked recourse by Kant to the metaphysics of moral being preceding his own philosophy. Giambattista Vico has recently been rediscovered as the »founding hero« of cultural studies. The article tries to review this rather oldfashioned approach in the light of actual Vico studies whose main tendency is a systematic study of the whole of Vico’s philosophy. The three main figures of the famous frontispice of the Scienza Nuova - Metaphysics, Hercules, Homer - represent the three leading intentions of this philosophy: an epistemology which is based on the mondo civile, the man-created political and cultural world (instead of nature), and its two principles: Hercules, i.e. material work and political organization, and Homer, i.e. the mental appropriation of the world through poetic signs. The article demonstrates the systematic coherence of these principles as well as the main lines of the reception of Vico’s philosophy: after the historicist line of interpretation, Vico became the epistemological father of the humanities. Volker Gerhardt: Josef Simon, Fremde Vernunft.